Download Jeff, Who Lives at Home in Digital HD from the iTunes store. Jeff, Who Lives at Home images are © Paramount Vantage. All Rights Reserved. This fun film comes out of left field changing wacky into wow. The movie is called Jeff, Who Lives at Home and stars Jason Segel in a role not too unfamiliar for him. The cool thing about Jeff, Who Lives at Home comes with the unexpected following Jeff's usual unpredictable day. The movie centers on Jeff (Jason Segel) a hapless grown-up guy who spends his days in the cellar of his mother's house. Lost in thought or just some inane thing, his days are usually quite uneventful. On this one day however, he gets a strange call looking for Kevin. When he tells the caller that there's no one there by that name, Jeff hangs up. Moments later his mother (Susan Sarandon) calls and asks him to go on an errand to purchase some glue to repair a door slat. Even though perturbed by this parental command, Jeff leaves the house on the quest. When he starts getting strange inferences to the name Kevin, his quest becomes an obsession. Jeff, Who Lives at Home is directed by the brothers Duplass known for their offbeat films like Cyrus and Baghead that provide interesting characters within a creative story. Here they accomplish just that and add another dimension to their films, the unexpected. I went into the movie thinking the worst from the title and the trailer but came out a believer in this director/writer duo much like they won me over with Cyrus. Segel carries most of the comedy, but helping him along involve two of my favorite stars, Susan Sarandon and Ed Helms. Helms plays his conflicted brother Pat and impetuous guy who has been causing problems in his marriage by purchasing things that are contrary to their lifestyle. His attempts at smoothing over his relationship with his wife (Judy Greer) isn't working so well and he's become suspicious of her love for him. He has always thought of his brother Jeff, as the useless member of the family, but it's the two of them and their encounter that make the story wacky. Susan Sarandon gives an outstanding performance as Jeff's widowed mother who has been at a loss with his ambitions and her love life. This romantic desire, especially at her age where meeting men wanting to work on a relationship, has been out of the question. Even her friend and fellow worker (Rae Dong Chong) has been trying to get her on the playing field. Her character puts important elements of the story in motion and she does it extremely well. 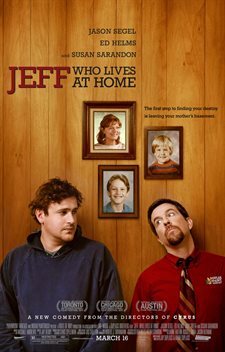 Jeff, Who Lives at Home has been rated R for language including sexual references and some drug use. If you really want to add fun to your film viewing experience, dig out your old DVD of the movie Signs and watch it first.